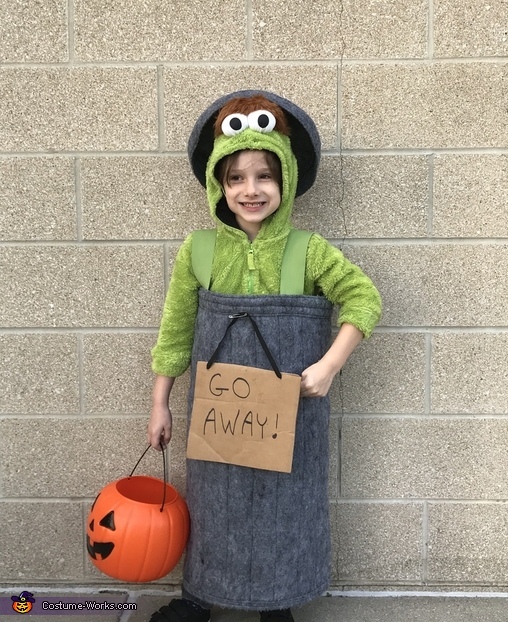 This is my son, Arlo in his Oscar the Grouch costume. He went as a Minion last year. After his birthday in August, I asked him what he wanted to dress up as for Halloween this year. He immediately said Oscar, and his grandmother and I went to work on the design. Grandma was hesitant to work with green fur, and by some miracle she found and Oscar hoodie on Amazon. We designed the trash can and lid together. Grandma did all of the major sewing, and I made the sign and some details on the can lid. He loves this costume so much he wants to wear it everyday to school now!